Update: MAG would like to take this opportunity to say Thank You to everyone who came along today. Thanks in particular to Eric& the staff in Lee Motorcycles. The original post remains below for information. Come along to Lee Motorcycles in Cork on Saturday 12th May where MAG Ireland will be undertaking our second “meet and greet” event. These events are intended to allow you to meet, in person, the people who work tirelessly on your behalf. We like to talk, so if you have any questions, queries, comments or simply want to chat about bikes then please come along and meet the crew. You can also join MAG (or renew a lapsed membership) on the day. Find out the latest about the hot topics such as EU Regulations, Mandatory High Viz, and the third driving license directive as well as what else we’ve been up to lately. If you have a question, we’re here to answer it in person. We’re currently finalising details for the re-launch of MAG Cork, so if you’re interested in doing your bit locally, come along on the day and talk to us. 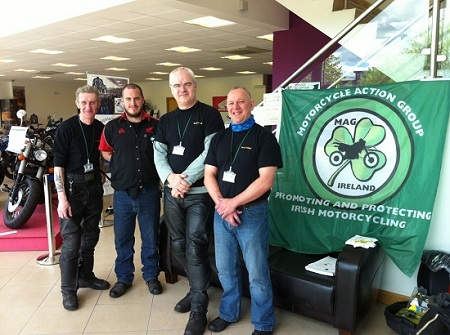 MAG Ireland would like to take this opportunity to thank our hosts, Lee Motorcycles Limited, for sharing their premesis and their expertise.